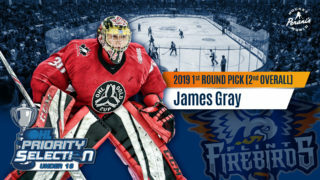 Flint, Mich. – The Flint Firebirds return home to the Dort Federal Credit Union Event Center for a pair of games beginning Friday night at 7 p.m. (ET). 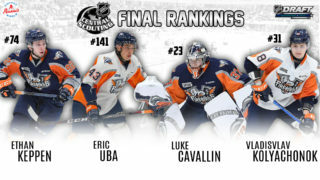 The Firebirds host the Sault Ste. 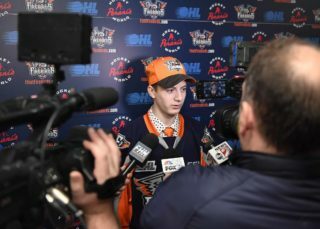 Marie Greyhounds Friday for the club’s fourth-Annual “Military Appreciation” game and Saturday, the Firebirds welcome the Mississauga Steelheads for a Harry Potter themed Teacher Appreciation Night. Friday, Complimentary Silver Level tickets are available for all veterans and active duty military personnel courtesy of HAP, Comcast Business, The View Newspaper Group and DM Burr. Discounted tickets at $10 are available for family members who accompany the veterans and active duty military personnel. The Firebirds will also be wearing white digital camouflage jerseys that will be live auctioned immediately following the game with all proceeds benefiting McFarlan Veterans Memorial Park Project. There will be an oversized flag presentation in partnership with Genesee Junior Reserve Officer Training Corps (ROTC), compliments of Gander Outdoors. During the first intermission fans will see a live induction ceremony on the ice conducted by Brigadier General, Michael A. Stone of the Michigan Army National Guard, prior to an on-ice shoot-out between the local military service branch representatives. Military vehicles will be on display and there will be a 10% discount for all veterans and active duty military personnel at the Firebirds’ official merchandise store, the Birds Nest. Saturday is the Firebirds’ inaugural Harry Potter Night in conjunction with Teacher Appreciation night featuring complimentary tickets for all administers, teachers and staff courtesy of the Flint Firebirds Foundation. The first 500 fans in attendance will receive complimentary wizard glasses sponsored by Dr. Peter Vergos and Center Road Vision Care. Join the Firebirds as we transform the Dort Federal Credit Union Event Center into Hogwarts! Dress as your favorite character, catch the Hogwarts Express at Platform 9 ¾ and be transported into a night of magical entertainment. Fans can attend Hogwarts classes and visit vendors in Diagon Alley during the game on the concourse and meet-and-greet with your favorite characters from the beloved series. There will be non-alcoholic and alcoholic Butterbeer and fans also have the opportunity to participate in Quidditch Broomball during the Firebirds first intermission. The Firebirds would like to thank the following vendors and volunteers: Sewing Laboratory, Lathe Junkie Flint Children’s Museum, PAWS Animal Rescue, All Natural Healing Associates, Double Dragon Tang Soo Do and Cosplay Crusaders. Blue Line Club Menu: Presented by Great Lakes Sandwich Co & Cafe, Friday evening’s menu for the Blue Line Club features voodoo pasta with sausage, Italian meatballs, garlic herb baked chicken, macaroni and cheese, steamed broccoli, sweet buttered corn, garden salad, dinner rolls with butter and assorted desserts. Saturday evening’s menu features chicken parmesan beef with broccoli, spaghetti with meat sauce, AuGratin potatoes, steamed vegetables, garden salad, dinner rolls with butter and assorted desserts. The menu is available to all sponsors and season ticket holders for $18 per person for an all-you-can-eat buffet, $12 for one trip, $6 for children 12 and under or $5 for an individual garden salad. Dinner RSVP’s are encouraged by emailing Karla Turner at karla@flintfirebirds.com.